And we're back with another recap. We're back to our regular scheduled programming of covering a single week: December 16 to December 22. @ben added haptic feedback for a few missing places for the iOS app. We reduced our bundle size by... a lot. 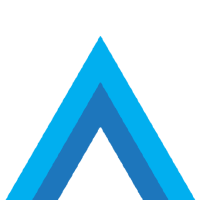 Thanks to @ben; check out his post and PR for more details. We now have two year badges. Thanks to everyone who has been with us for two whole years! Badge automation by @ben, badge design by @liana. 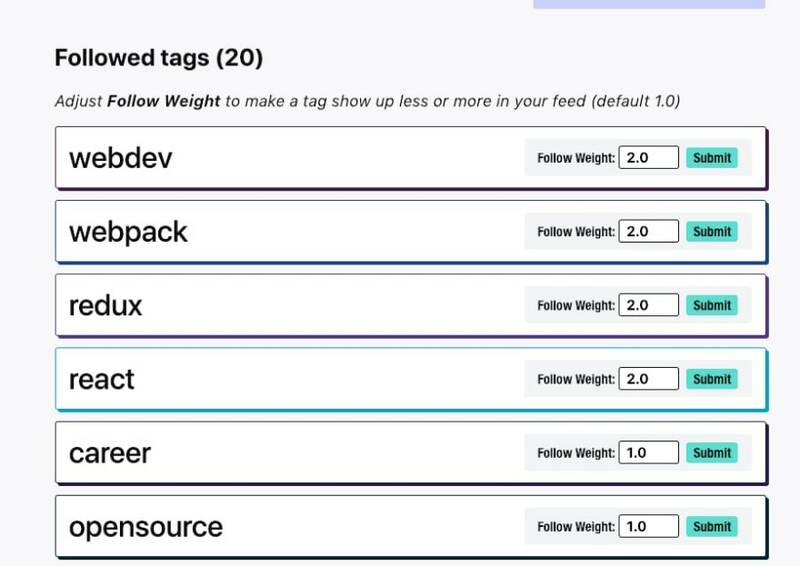 Thanks to @ashwinv11 for adding heading tags to all our <header> tags! Thanks to @moriczgergo for adding a better description about publishing via RSS! Thanks to @vinistock for starting the PR to add the Sail gem! @ben fixed an issue with our Twitter Liquid tag not rendering the text in retweets. If you have this issue with your posts, resaving it should render it properly. Thanks to @imadityang fixed webpack-dev-server for docker-compose! More details below. We had an issue with highlighting text in Connect. This is now resolved, thanks to @mariocsee! We fixed an issue with the reaction button not rendering properly in notifications page. Let us know if you have see any issues related it to that. Thanks for fixing a typo on the organization admin page, @anant90! Describe the bug Making a header next to a code block with a horizontal scrollbar makes an area overlapping with the scrollbar and the header. This makes us select the text instead of / while moving the scrollbar, which is annoying. -``` Ignore the prefixed -, this is for the github markdown. --- Continuing the line to get a scrollbar, you can ignore this content. # This is a header. It should overlap with the scrollbar. Preview or post it, and try moving the horizontal scrollbar by selecting an area above the header text. Expected behavior The scrollbar moves without selecting the text. Where h1 can be h1-h6. @yafkari requested a feature where you could add articles to your Pocket list. 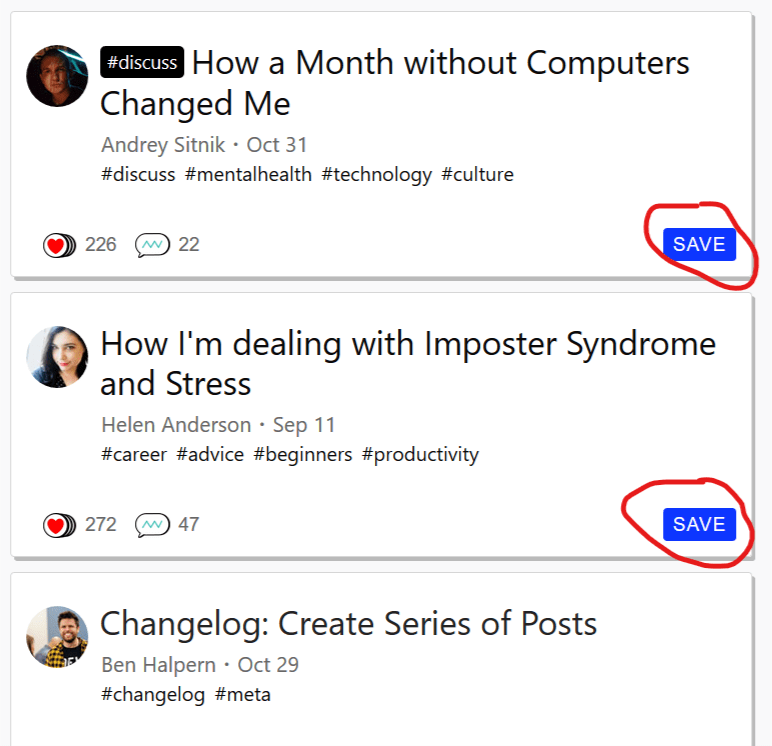 @imadityang reported an issue where the save button renders incorrectly in the reading list after clicking "LOAD MORE POSTS". 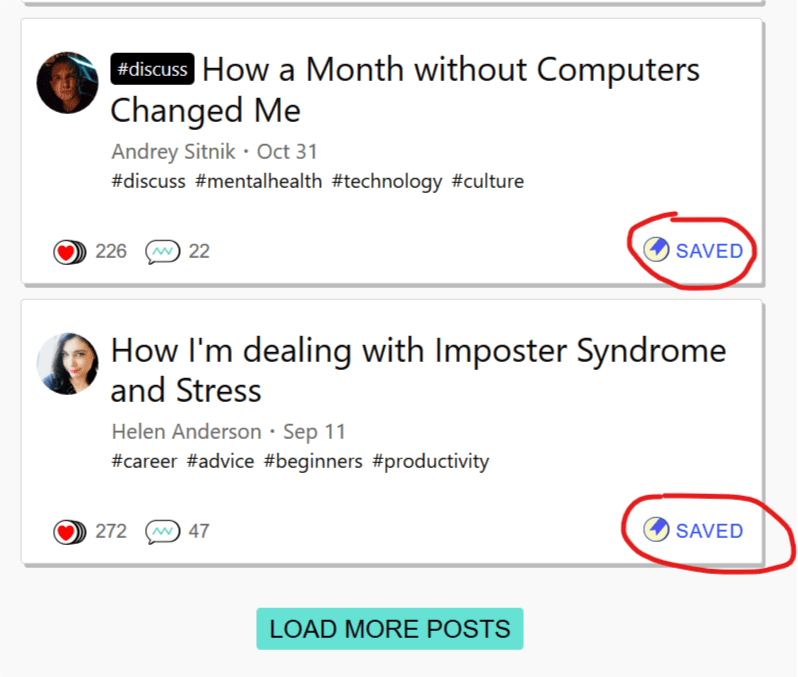 Now below every post you should see a "SAVED" button indicating post is bookmarked. Scroll down and click "LOAD MORE POSTS"
Now, below every post you will see a "SAVE" button as if posts are not bookmarked. @2lach requested a UX improvement where you could update all the weights of your followed tags with one click. 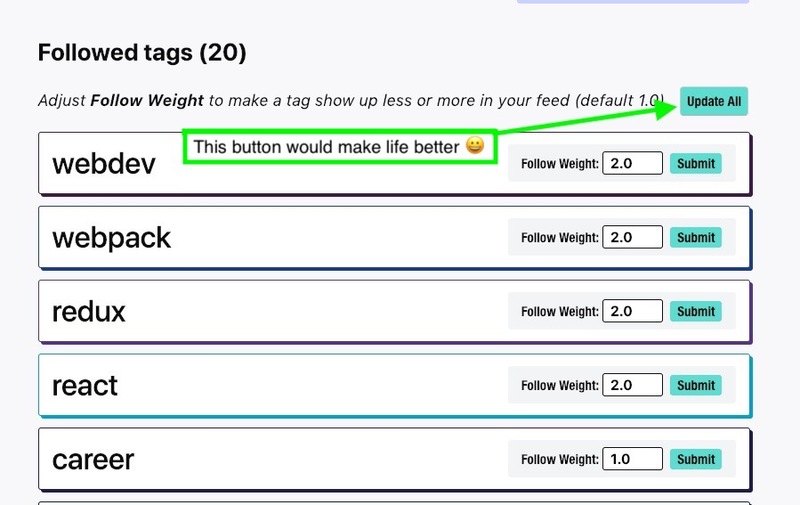 On the Followed tags page the user can only submit a single new value for follow weight per submit. Proposed solution Since i suppose most users of dev.to (myself included) update several topics at the same time, I suggest a update all button. This way there is no need for several clicks when updating follow weights = () => which makes happier users and also less data traffic with fewer requests. Alternatives Keep it as is or maybe just save all edited values in localStorage so the input doesn't loose it on Submit. Not as awesome as with an update all button. but still the follow weight is a nice feature in an already awesome community. @alextakitani started a discussion about having a section in your profile called "Share my Development Setup". I was writing a blog post to share my dev setup with my colleagues so they can copy the parts that make sense to theirs. I like to read posts like that, always end up learning a thing or two. I maintain a script on a gist that installs and configure my dev machine, and I try to keep it up to date, so I can always rebuild everything if needed. 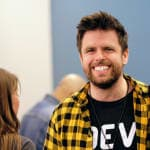 So, while drafting that post, I through that I should build a website for people to share their setup, and while searching for a domain name that I liked I remembered of dev.to. I think it should be the perfect home for it since is focused on devs, open source with a nice community. So what I suggest is a page, for each user to share his setup. It should have tags so others could search for things like "rails" "ubuntu" "postgres" "vscode" etc. Users should be encouraged to keep things easy to reproduce, either for they own use as for others as bash scripts, docker images, puppet recipes or something like. It should be "likeable" so people can sort when searching for a setup. It also should be "followable" so people that like that setup get an notification when something changes. Also, comments would allow others to contribute with tips for the user. I think it would be a great thing for beginners to have a nice setup ready, and for experienced users to learn about new tools. It would be great if any new setup or any big change into a existing one gets into the Feed. @bencodezen requested a feature where you can schedule when a post publishes. In order to create a consistent flow of content for users, it is critical to have the ability to schedule posts since life often gets in the way. And to be honest, it's hard for the writing muse to strike with inspiration sometimes and it'd be nice to schedule out posts for a future date. Currently the publish property takes a boolean of true or false, but it should also accept a date/time value in ISO-8601 format (which I assume most authors on dev.to are familiar with) that runs a script to set the markdown property to true after the given time. As someone who used to author content in WordPress, they had a section to manage the data state of a post (i.e., published or draft, time to publish, time updated, tags, etc.). However, while this seems straightforward, I know that this would put a fair amount of work on the team, so I'm suggesting the simplest solution in order to get the feature out sooner rather than later. If you have any questions or want to chat more about it, feel free to reach out to me! @codemouse92 reported an issue where bullets did not render in a tag's wiki seciton. Markdown bulleted lists (with a * at the start of each line) do not render in the tag wiki sections. 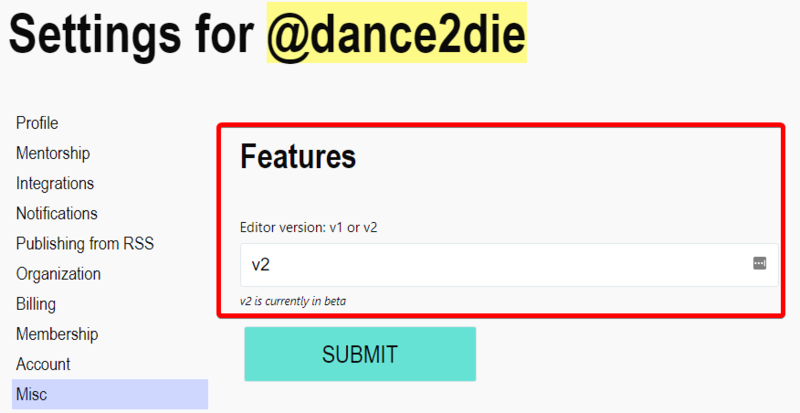 @dance2die requested that articles imported via RSS have their editor version based on your user settings. After setting the editor version to v2, new posts can be written using v2 editor. But drafts imported from RSS uses v1 editor. but clicking on edit for the imported draft uses v1 editor. New post & existing posts (I used the word draft above) should use the editor version set in the Settings > Features. An alternative is to let authors choose an editor in the Edit page. @rhymes reported a bug where the V2 editor settings modal has a broken layout in smaller screens. Opening the upload image overlay in the v2 editor with a 13" inch screen and trying to upload an image, breaks the layout. @chiangs requested a feature that allows you to create different types of reading lists and share them. Is your feature request related to a problem? Please describe. 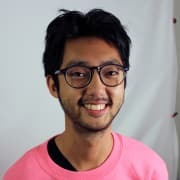 I would love to create several reading lists, or dynamically filter them and share that filtered list via a unique link to my colleagues and mates in topic specific group. I’m the admin for ngStavanger and would like to post up a link in our slack channel or fb group. A member clicks on it and immediately gets the curated reading list of my saved / filtered articles of Angular subjects from dev.to. 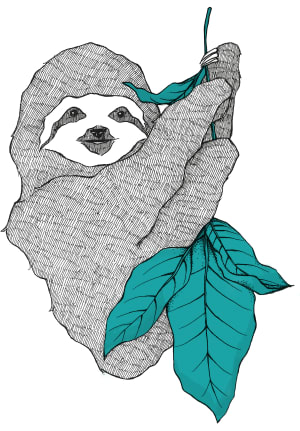 @abraham reported a bug where images are not responsive in emails (notably Gmail). 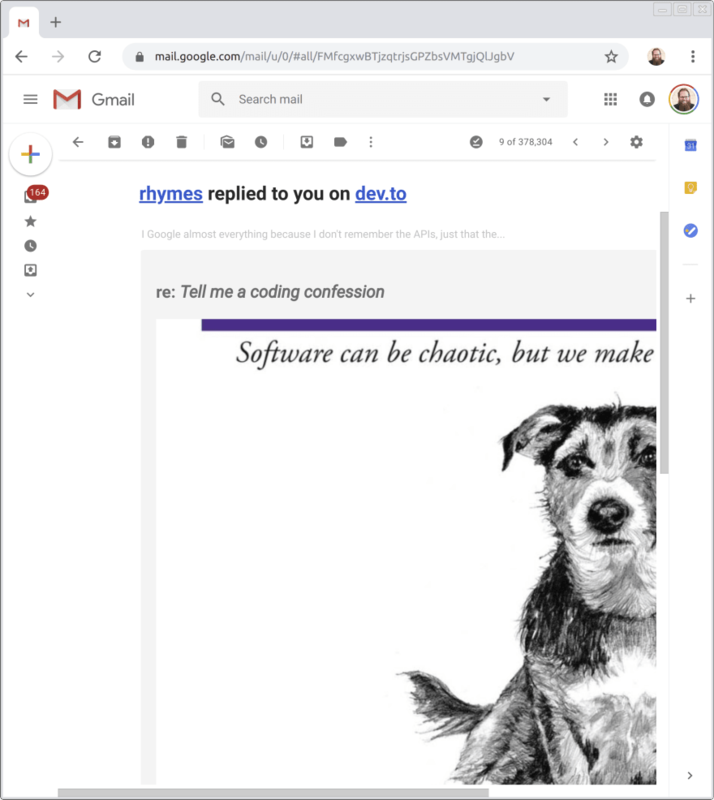 Images in comment notification emails can be large and not display in a scaled manor. Have someone else reply to your comment with an embedded image. Look at the comment notification email in Gmail on the web. I would expect that the image would be no wider than the width of the displayed email. @yafkari reported a bug where the save button is inconsistently rendered in the reading list. The problem appears only on mobile, with chrome but not every time. It's a bit complicated to explain but I'll try. Normally the SAVED button will have become SAVE, otherwise try again, like I said the problem doesn't appear every time. @rhymes requested a feature that allows you to filter a someone's posts based the tags of they've used. Some users have many posts on their profile pages, it would be nice to be able to filter those by tag. As always, we encourage you to add any thoughts to the issues. Discussing them helps us iterate on ideas, and adding details to bugs helps us fix them. Thanks for reading, and see you in the new year! Thanks to @ben , @liana , @ashwinv11 , @moriczgergo , @vinistock , @link2twenty , @imadityang , @mariocsee , @jess , @anant90 , @antogarand , @yafkari , @2lach , @bencodezen , @codemouse92 , @dance2die , @rhymes , @chiangs , and @abraham for your contributions! Thank you Andy, keeping these lists is quite the work!